Some might not get it, but Sierra Nevada understands fall comes before winter, and bless them and their brown ale for that. This might not be my favorite beer of theirs ever, but hell, it's Sierra Nevada and Sierra Nevada doesn't make bad beer. Therefore you can skip the rest of this review and just buy the Tumbler. Tumbler is a brown ale, so not surprisingly it also looks brown. Deep, deep brown at that, and the head actually exceeds two fingers. I kid you not. You could get away with just sipping the head here, it's that flavorful. Sniff it and roasted malts hit the nose gently, like with a lovable little slap. A sweet companion scent follows it. That's largely a feeling that follows over to the flavor. This is a roasty, smokey beer, and if I have one criticism of it -- and I do -- it's that a monotones flavor might be just a bit overpowering. Now don't get me wrong, that is a nice flavor, but it can get a bit old after a while. It's almost like eating a piece of bread, the roasty maltiness. Either way, overall, this is a good ale, and expectedly made at that. It's not quite something I love, but it's something I like. And you will like it too, that much I know. 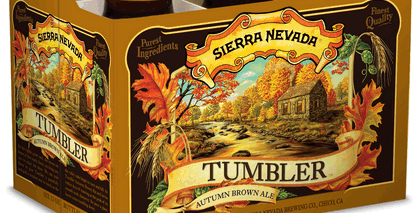 Vote for Sierra Nevada Tumbler Autumn Brown Ale: It’s your civic duty!